It goes without saying, that some programmers are having a hard time handling emotions. One reason for this is the purely rational style of programming languages. When it comes to software development the mere word “expression” is stripped off its emotional value, being left only with a petty logical meaning. We definitely need to change this! We need to free the emotional part. 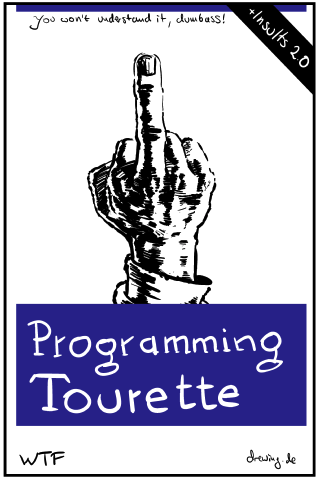 We must reinstate it as the equal partner of rational thinking within the realm of software development. With an emotionally enhanced programming language developers will be twice as productive. Why? Because the old reason-driven programming languages only make use of the left hemisphere of the brain. Emotionally enhanced languages are using the right as well as the left half! A first step would be to allow the emotion most prevalent in the developers mind (anger) to be expressed easily and as naturally as possible. All the verbose clutter of Java is gone – leaving only the pure emotional expression! But we shouldn’t limit the art of programming to the written word! Remember, we’ve already got gesture recognition. And almost every computer has a webcam. Soon we’ll be seeing developers taking acting courses to improve their coding skills. I already see a lot of programmers gesticulate in front of their computers. Imagine this concept applied to pair programming! It will lift development to a whole new level of emotionally enriched experiences. And agile development with scrum will also be improved. Now the development team doesn’t produce increments any longer, but excrements!